In the first part of this series, we explored how Facebook’s new Campaign Budget Optimization feature allocates spend optimally across ad sets in your campaigns and the performance benefits (amongst many others). CBO is a great feature if you want to spend your budget where you can get the most conversions. What if you’re limited to a certain budget for a specific audience though? This is often the case in retail chains where local outlets pay for their share of online ads, or in ad agencies whose budgets are defined by the agency’s customers. In these cases, CBO and its budget fluidity across ad sets might be unwanted. In February 2019, Facebook announced plans to make Campaign Budget Optimization (CBO) the default and only way to manage budgets. Budgets will be managed solely on the campaign level as opposed to the ad set level and there will be no opt-out. Even eligible existing campaigns will be automatically converted to the new system. The eligibility criteria or exact schedule is not known, but Facebook says the change is coming sooner or later — and you should start preparing! Fear not, you still have control over how your budgets are spent! Set minimum spend targets and maximum spend caps on the ad set level and Facebook will aim to optimize your budget with the minimum target without exceeding the maximum cap. In short, the ad set maximum spend cap is a very similar concept to the old ad set budget. The example above achieves the same end result as running the ad sets on $50 budget each: Facebook will have no choice other than spend exactly $50 in both ad sets. 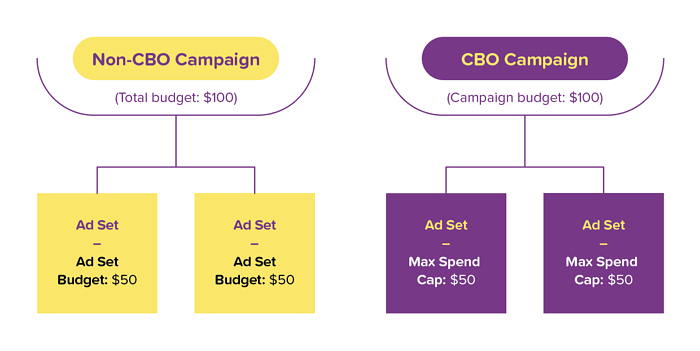 In other words, for maximum control, define a maximum spend cap for each ad set so that their total does not exceed the campaign budget. If all else fails, if you only have one ad set in each campaign — be it for technical reasons or just the workflow you are used to — CBO won’t have any effect on your campaigns. It still pays off to explore and test if CBO could improve your performance, if you can consolidate your campaign structure!